This portable, wearable voice changer synthesizes and distorts your voice. Unit has 2 settings: Scary robot voice, and transposed version of your own voice. Includes belt clip. Includes enough wiring to connect unit from your belt to a microphone that you wear. This Multi Voice Changer can change your voice into 8 different sounds. Funny and practical. 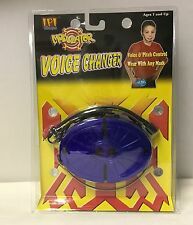 1 Voice Changer. 8 different voices: Male (3 types), Female (3 types), Robot. Portable, wireless design. 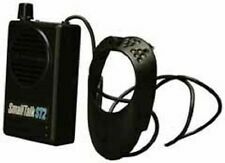 Voice Changer With MicrophoneComplete your disguise with the voice your scary creature.Includes: Change your voice into 4 creepy characters. Requires 9 V battery.One Size. - Includes special effects sound box and microphone. 8 different voices: Male (3 types), Female (3 types), Robot, and Original. 1 Voice Changer. Portable, wireless design. With an on/off switch, 9-volt battery powered (not included). The degree of change can be adjusted as you are speaking by pressing the buttons located on the front of the unit. Trending at $14.91eBay determines this price through a machine learned model of the product's sale prices within the last 90 days. (Portable 4 Multi mode Smartphone Cellphone PC Voice Changer Changing With Earphones fit for Apple Android. 1 x Smartphone Voice Changer. 1 x Earphone. 8) Connect to 3.5 mm earphone jack of phones or computers. Can change your voice from male to female or female to male freely. It can change to 8 kinds of different voices: Male (3 types), Female (3 types), Robot, and Original. 1 Microphone. 1 Speaker. Color: Black. Style:Voice Changer. Voice changer unit. Just pull the trigger to turn it on and speak into the microphone it amplifies your voice and no matter what your real voice sounds like, you can change it! Here's a very cool compact voice changer that fits comfortably in your hand. Put device over mouthpiece,make sure that sound insulator surrounds the mouth piece. Speaker: Voice output piece (fits over phone mouth piece). Speak into sound input(avoid frequently used speak structure for best result-fake the voice). Portable Wireless Mini 8 Multi Voice Changer Microphone Disguiser. 1 Voice Changer. 8 different voices: Male (3 types), Female (3 types), Robot, and Original. Portable, wireless design. 1 User Manual. voice changer kit. Condition is New. Shipped with USPS Priority Mail. This Multi Voice Changer can change your voice into 8 different sounds. Funny and practical. Features: Portable, wireless design. Just put this voice changer close to your mouth, and your sound will change as you please. Suitable for telephone, mobile phone and online chatting. 8 different voices: Male (3 types), Female (3 types), Robot, and Original. The degree of change can be adjusted as you are speaking by pressing the buttons located on the front of the unit. `This Multi Voice Changer can change your voice into 8 different sounds. Funny and practical. 1 Voice Changer. 8 different voices: Male (3 types), Female (3 types), Robot, and Original. With an on/off switch, 9-volt battery powered (not included). Mini Wireless 8 Multi Voice Changer Microphone Disguiser H4306. This Multi Voice Changer can change your voice into 8 different sounds. Funny and practical. 1 Voice Changer. 8 different voices: Male (3 types), Female (3 types), Robot, and Original.